SHAH ALAM: An upgraded version of the national crime alert mobile application, MyDistress, is now available. The initial version was introduced in August last year and featured a simple press HELP button, which would alert rescue teams while immediately detecting a user’s location. The application is supported by the smartphone’s Global Positioning System (GPS) which enables the police to immediately identify the victim’s location. The new version comes with additional voice and visual recording capabilities when the emergency button is activated by the user. This is how it works: DCP Tun Hisan showing the latest version of the MyDistress mobile application which comes with additional voice and visual recording capabilities. “The visuals and audio recorded at the crime scene will be sent to the police and is similar to the emergency call. 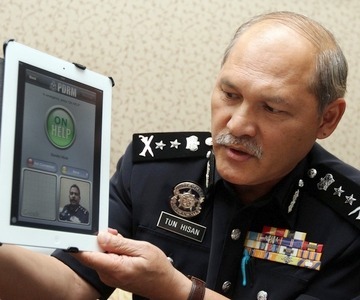 “Previously, users would only be able to send a distress signal to the police, but now after pressing the emergency button, the recording will be automatically relayed to the police and will enable the victims to get help,” said Selangor police chief Datuk Tun Hisan Tun Hamzah. This new feature would also assist the public in recording the registration number of the vehicle at the scene of a crime or accident. He added that the service was free for all smartphone users and can be downloaded from their respective app stores or the MyDistress site www.mydistress.net. The signal, once activated, will be sent to the Selangor police headquarters and eight district police headquarters for immediate action and dispatch of assistance. The service is also very useful for the hearing and speaking impaired as all that is required would be the touch of a button. Further upgrades to the MyDistress application will feature an Emergency Contact button, which will allow the police to contact a victim’s next-of-kin in case of an emergency, an information blast function which will give the public access to new information released by PDRM on a regular basis and also a message function which will support up to four languages English, Bahasa Malaysia, Chinese and Tamil.